The new year is already taking shape with exciting blues releases coming our way beginning with Joe Louis Walker this month and now we are getting the first details about the Feb. 21 release of new music from Guy Davis. 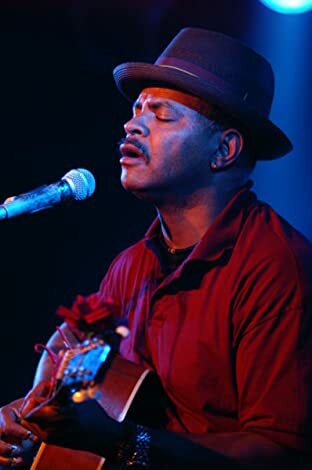 Guy Davis will release a 2-CD "audio play" version of his one-man play The Adventures of Fishy Waters: In Bed with the Blues. Davis, the son of noted, treasured actors Ossie Davis and Ruby Dee, has performed this play all over the world since 1994 and he'll be performing exceprts from it throughout 2012 to support this first-ever audio release through his own label Smokeydoke Records. The play includes original Davis compositions as well as songs by Robert Johnson, Reverend Gary Davis, Blind Willie McTell and Big Bill Broonzy. "Story telling is the most ancient, most powerful magic of the universe," said Davis, and next month those of us who have never seen the performance will have a chance to hear the stories of his character Fishy Waters. Waters travels across the South and meets a host of other characters, all with their own stories. I have to imagine some things will be lost by having an audio only version, yet the heart of this play is the stories and Davis has been singing and telling them for more than 20 years. I'm eager to hear this. I got to see Davis perform in Memphis at the Blues Music Awards in 2010. I'd heard of him but never heard him and he was a revelation to me that night.